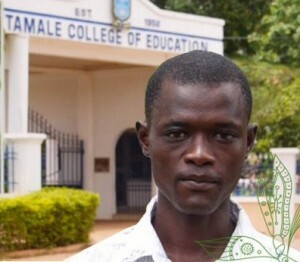 Alhassan Awal is about to graduate from the College of Education in Tamale, Northern Region, Ghana. That’s an impressive accomplishment on its own, but what’s even more impressive is the journey he took to get there and where he plans to go next: back to his home village of Sang to the same school he graduated from not so long ago. Northern Ghana is extremely challenged to attract and retain qualified teachers, so “homegrown talent” is to be encouraged and nurtured. Awal was born and raised in Sang, where his mother and two brothers still live. He attended Zakaria Islamic Primary School, and after graduating from secondary school, returned to his old grade school to teach—untrained and unpaid. At Zakaria Islamic Primary School in Sang, Ghana, demand for education exceeds supply. Although there is still a great need for classrooms, school supplies and furniture, what Sang does have is a community that places a high value on education, and has dedicated a great number of resources to advocate for it. Sang’s Parent-Teacher Association and its School Management Committee are well-organized and have broad support from the community. Meetings are well-attended, and participants are working collaboratively with teachers to improve conditions and practices in the school so that children can attend and learn better. Even the Savelugu District Assemblyman, who happens to be a teacher in another community, plays a role on Sang’s School Management Committee, where he’s learned some tips and techniques to organize and build community participation in children’s education in his own community. With an entire community making their education a priority, Zakaria Islamic Primary School students have a brighter future, thanks to teachers like Awal … and supporters like you.